Beautiful, natural wood interior finish with strong fiberglass exterior. Sophisticated look. Solid and durable. Beauty Combined with Exceptional Durability. The Essence Series patio door can bring a high level of sophistication to your home. Featuring a durable fiberglass exterior and a natural wood interior, the frame has been engineered to have no visible fasteners for lasting beauty and exceptional performance. Essence Series patio doors combine the beauty of a natural wood interior with the durability of a fiberglass exterior. The interior can be painted, or stained and sealed to show off the wood grain. 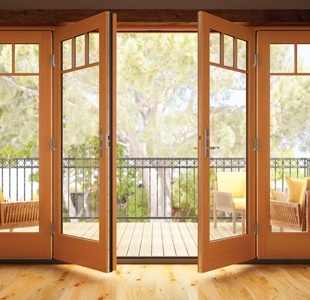 Choose from Douglas fir, natural pine or primed pine for a stunning wooden patio door that is perfect for replacement or new home construction. 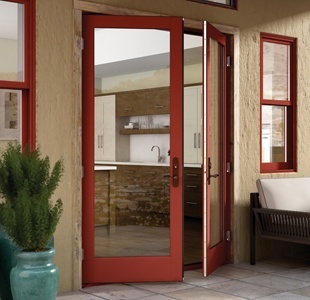 Milgard offers 16 powder coated colors for its Essence Series patio doors. This method of applying paint is more durable than conventional finishes, resulting in a lasting color that is less likely to chip, fade or scrape. The fiberglass exterior is low-maintenance and offers long-lasting performance that will not crack, peel, bend, warp or stick due to expansion and contraction. It is also resistant to cold, heat, water, insects, salt air and ultraviolet rays. Enjoy superior energy performance with our SunCoat® Low-e glass coating that comes standard. Essence Series patio door hardware is available in oil rubbed bronze, white, clay, slate black or tan painted finish colors. Plated finishes are brushed chrome, or satin nickel. Add the optional SmartTouch® Bolt for additional points of security, or, if you prefer to hold the door open in a vented position. Essence Series patio doors offer frame trim kits that are specifically made for the Essence Series. Available in all 16 exterior colors, options include Flush or Mitered joints in Flat Casing or Brickmould. Backed by the Milgard Full Lifetime Warranty, we will repair or replace any defect in materials or workmanship and will pay the costs of all parts and labor for as long as the purchaser owns their home. Glass Breakage Coverage is included. If the home is sold, the warranty extends 10 years from the install date. The doors were just what we were looking for. They not only meet but exceed our expectations in terms of quality, appearance and features. Very pleased with the quality and appearance of the sliding door. The interior Douglas fir frame is clear and very well crafted. Door is very solid and the lifetime warranty is what sold me. Our new Essence Series French Sliding doors are absolutely beautiful. High quality and just stunning. Very happy that we chose Milgard. Essence Series French-style sliding patio doors come in 2, 3 and 4 panel configurations all custom made to your specifications. They are engineered with a weather-strip system and top quality rollers that provide an impressively smooth and quiet operation. Choose the Essence Series French-style in-swing patio door to accent a spacious room. The door swings inward, creating an elegant entrance. Choose from 1, 2, 3 and 4 panel configurations. Our Essence Series French-style out-swing patio door can provide a grand entrance onto your patio. This high performing door is beautiful and makes an elegant statement. 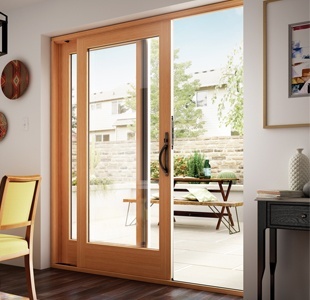 Essence Series® Patio Doors is rated 3.8 out of 5 by 213.